DAY 42. 18 JUNE 2016. GIJÒN HOLIDAY! Gijón to Avilés (the next stop) is 25km away and my father and Linda arrive in Santilliana del Mar on 21 June, so I've decided to stop walking West and have a few days holiday before meet up with them. It's strange to unhook myself from the Camino; like choosing to turn off a powerful magnet which has continually drawn me for 40 days. So today I'm a tourist and not a pilgrim. The difference is that I am stopping here for the sake of it and not just passing through. It's a noisy night and people start leaving at 6.30am, but I have a lie in and manage to miss breakfast. Nothing opens here until 10am so I walk into town to explore the Old Town which is on a peninsular between two long sandy beaches; the surfers are out already though. I've decided to stay where I am tonight, but find a student albergue serving breakfast in the Old Town, not far from the bus station. 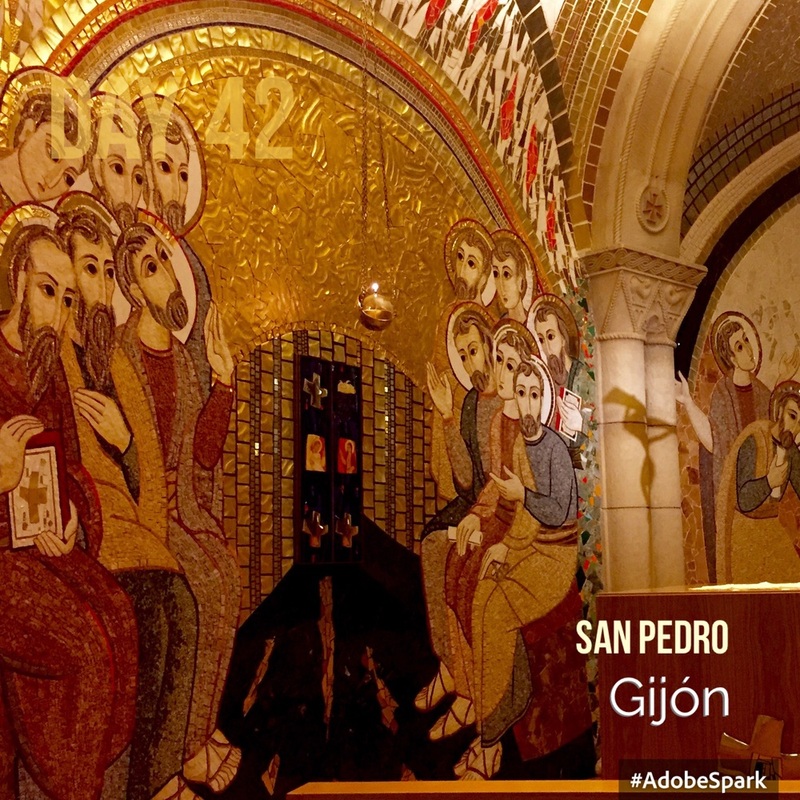 The church of San Pedro was built in the 1950s on the peninsula and is miraculously open! It's full of nice artworks, including a series of striking mosaics covering a curved ambulatory chapel. I spend some time there. Then I walk to the fort on the headland to visit a vast concrete sculpture by Chillida (1990). As you walk inside its volume the sound of the sea below suddenly gets reflected off the concrete in an eerie mix of waves and wind; it creates its own sound-piece. Wonderful. 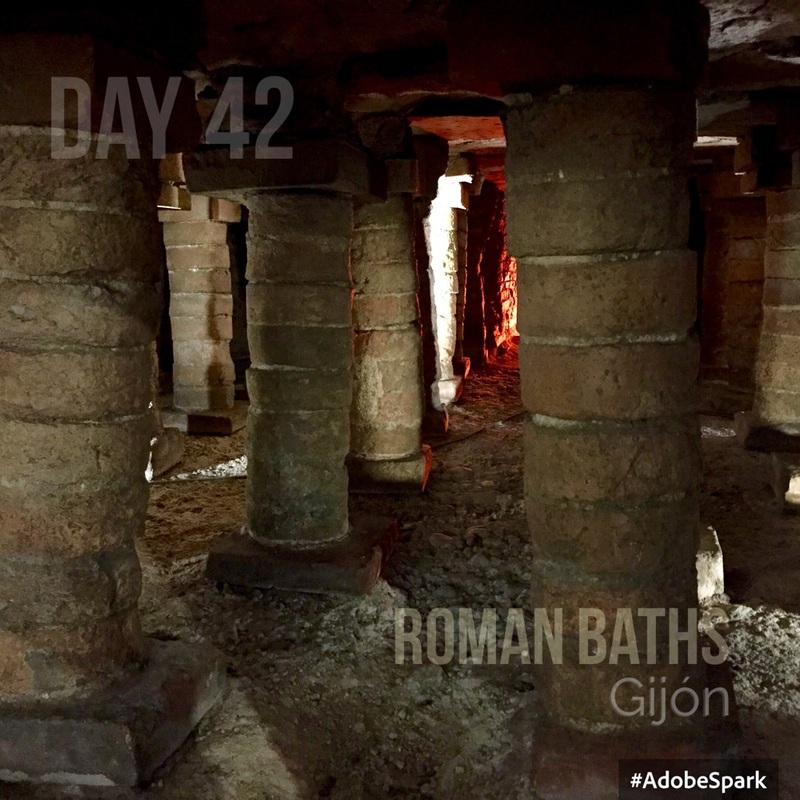 Then I visited the remains of the Roman Baths which are underground near the church. They had a photo of the thermal baths in Bath and I felt quite homesick! Then off to find a bank and a sidra and pinchos for a snack. It's served in plain glasses and poured from a great height, because it's not naturally fizzy. I get a good photo at last. It's a 40 minute walk to the Museu del Pueblu d'Asturies. Hardly anyone's there but it's a fascinating account of the Asturian culture and houses a museum of bagpipes. There is a wonderful large projection of a series of 3D black and white photographs recording life in the Province between 1907-1935. I find it quite moving, as old photos suddenly leap into life; cattle markets, poor peasant families in clogs, travellers crossing rickety wooden bridges and early mountaineers in the Picos. I even get to go inside several granaries and see an old cider press. It must have been very poor prior to industrialisation; the traditional houses had no chimneys. Then back to the albergue which is also a restaurant for a late lunch of mixed salad and BBQed pork ribs followed by a siesta. Looks like it's just me in the dorm tonight- that'll be gloriously peaceful!